I've revised the Gear Guide to focus more specifically on gear that I use for events. The page takes a move away from a generic listing to give a little more information on my specific use of the gear in my kit, especially with regard to lens pairings with my D2x. 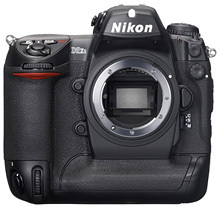 Previously, the guide gave a more general overview of the current DSLRs and suggestions for lenses suitable for concert photography. The revised page now keeps most of the latter, albeit in Nikon F-mount, but removes all camera-bodies except for my Nikon D2x. I'll be expanding this page with more specific information for the lenses and may add links to images as examples. In the meantime, I may add or reformat the previous information. First of all, i love your gallery. Great work! Concerts is what got me started on photography. It’s my first love. Unfortunately, i don’t have the funds and equipment to master it. I would really love to hear some tips from you. What would you advice begginers like me. Such as, what lenses you recommend? Or if you advice the use of flash… If not, and if ever you have no choice, what’s the best thing to do to your flash so that it wouldn’t consume the color or the lights. Since you’re asking about lenses, I take it you have an SLR. My personal preference for shooting from the front of the stage is a lens in the 17-55mm range with a constant aperture of f/2.8. Nikon and Canon both make lenses in this range, as do Sigma, Tamron, and Tokina. With concert photography, anything less than f/2.8 can start to be a liability, especially if flash is not allowed. I basically never shoot with flash because it is not allowed in most of the venues I work in, so I can’t advise on that. In addition to a f/2.8 zoom, the Sigma 30mm f/1.4 is a nice lens for low light work, and the 50mm f/1.4 or f/1.8 lenses from most manufacturers are relatively inexpensive options to gather a lot of light. Let me know if you have any more questions. Thanks very for stopping by to comment, glad you enjoy the work. I wasnt sure where to submit this question, so here goes… Have you experienced banding issues with the d700 at 3200+ iso? I seem to have it reoccuring and after looking through countless forums most claim it is common with the high iso and bright lights, although none of the forums were about concert photography specifically. Figured You would know best, any feedback would be appreciated. My experience is with nightclub photography, so they relate a bit! I’ve been photographing for only about 4 months properly and regard it as an expensive, addictive, hobby!! I’ve shot a couple of events now, and I’ve used a Nikon d5000 and the kit lens + sb600. I’ve obtained what I think are great results :)! I do feel let down whenever I see a professional phootgrapher with various pro lenses and bodies. But when I compare photos results I notice I’m not really far off! I take photography mainly as a hobby, but lately I have also got a numeruous bookings mainly for nightclub parties. I will sooner or later get a sigma 70-200 2.8 as I love photgraphing sports, and the 70-300 tamron is rubbish :)! As for the kit lens, it hasn’t really let me down much, i will most probably get a better lens… what would you suggest? I’m thinking 17-50 (tamron/sigma), or 24-70 ?